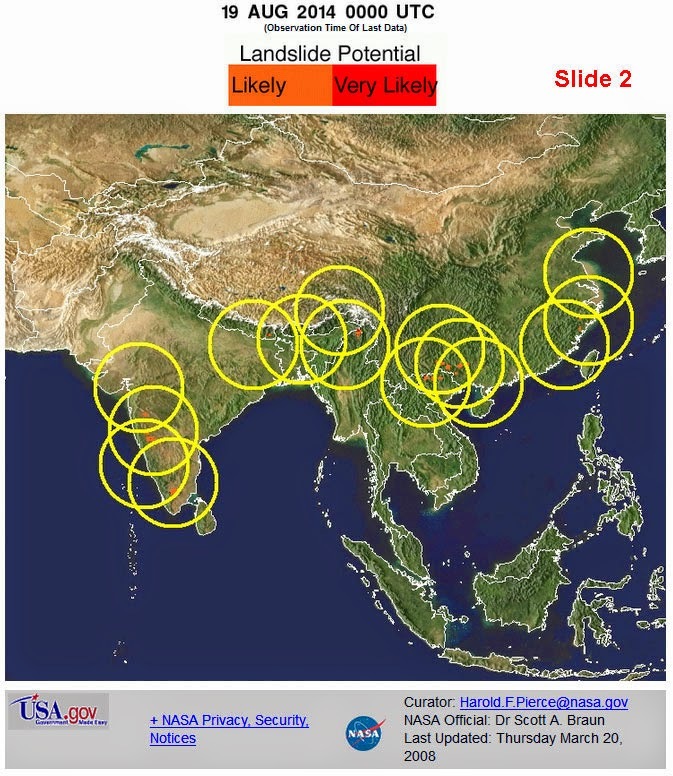 · The axis of monsoon trough at mean sea level runs close to the foothills of Himalayas. and neighbourhood has become less marked. However, a trough extends from Sub­Himalayan West Bengal; Sikkim to south Chhattisgarh across Bihar extends upto 1.5 km above mean sea level. Arunachal Pradesh, Tamilnadu; Puducherry and Lakshadweep. Heavy rainfall would occur at isolated places over Sub Himalayan West Bengal; Sikkim, Assam; Meghalaya, Arunachal Pradesh, Tamilnadu; Puducherry, North Interior Karnataka, South Interior Karnataka and Lakshadweep. 21 August (Day 3): Heavy to very heavy rainfall would occur at isolated places over Sub­ Himalayan West Bengal; Sikkim. Slide 1 shows past 7days of rainfall in India from TRMM. Slide 2 shows potential landslide sites also from TRMM. For anyone interested, the normal rainfall for the whole of July in Sub-Himalayan West Bengal and Sikkim is around 61cm. If the forecast is correct, this region could receive one and half times that rain (ie 90cm) in the next couple of days. This should be a cause for concern to all of us in the region and the intent of this post is to make people aware and prepared - without causing panic.